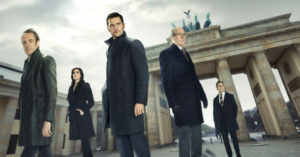 Berlin Station season 1 saw Richard Armitage’s CIA Agent Daniel Miller as he goes undercover in Berlin to track the source of a leak. The series followed Miller as he grew accustomed to the life of an agent in the field, including deception and moral compromises, as well as a whole lot of running. After a successful first series, Berlin Station is back for a second 10 episode season, and with some new faces, including Ashley Judd (B.B. Yates), and Keke Palmer (April Lewis). The second season will see a bit of a tonal shift, as the series moves to build on its timeliness. Season 2 opens just ahead of a pivotal election in Germany set against the backdrop of the rise of the Far Right in Europe. Judd is known to be very politically active, and so she jumped at the chance to take on this role of a strong female character in such a politically charged show. “I really feel like my character is the type of woman that the world needs now, and to have the station chief of the CIA in Germany, a great ally of the United States, obviously since the end of the Second World War, was a wonderful opportunity, and having that person be female is way overdue. Judd and Palmer will be joining a cast of characters who were scattered to the wind at the end of Season 1. “We are bringing people back, and it was difficult,” says Winters, when questioned about whether or not the original cast of character would be brought back together, following the events of Season 1. “I mean — but that was also the exciting challenge of it was how to, sort of, disrupt Berlin Station at end of Season 1, do some dismantling in the ranks, and then how do we pick up the pieces where we left off at the start of Season 2, and continue to move forward with an ensemble. Season 2 of Berlin Station will premiere on EPIX on 15th October, at 9pm. Great article about the second series of Berlin Station in 2017! But please note that Esther Krug is played by Mina Tander, non Nina. Thanks for that. Mistake of the transcriber. Corrected!